THAT PARASECT!!! I'm in love!!! his colors, the spacey look, oh my goodness I adore these!!! I like Mega Gourgeist the best! 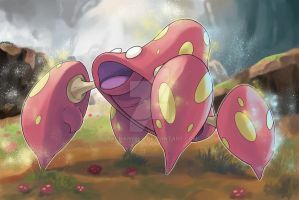 M. Vileplume appears to have a worse case than Parasect. I mean the guy's brain is literally a ghost now. wow interesting designs!!! i really like gourgeist! 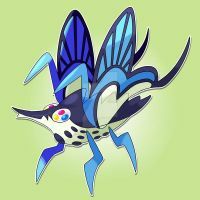 Nyjee are the final evolution variants of the starters almost done yet? Very creative, I like it. These look awesome. What would their abilities be? Goodness, Trevenant looks so cool. Well on drawing all of these, I really like Vileplume too. These are some very interesting designs. Good job. ooh what are the concepts behind these? These are so great ! All of these are fabulous~!! 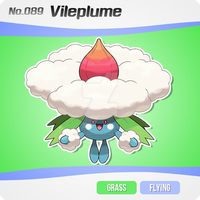 I really like the Vileplume one!! Creepy! Mega Gourgeist is really interesting, I like how she seems a melted candle. I don't think I understood Vileplume and Trevenant though.